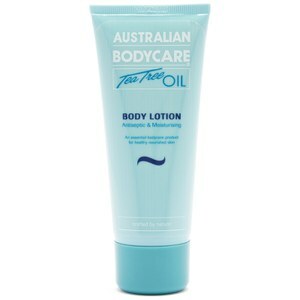 The Body Lotion from Australian Bodycare is a gentle antiseptic to rehydrate skin. Specially formulated with tea tree oil, this lightweight lotion provides nourishing ingredients which work to revive dry skin and retain the skin's natural moisture levels. The handy pump action bottle allows easy application and the lotion absorbs quickly into skin so you can experience soft and supple skin that is comfortable for hours. E.N. Use directly after waxing or shaving to help prevent ingrown hairs, as an everyday body lotion to maintain skin health, take on holiday to use as a cooling and refreshing post sun treatment and whenever your skin feels dull and itchy. After gently drying the skin use the palms of your hands in sweeping circular movements to massage this nourishing, cooling and calming lotion into the skin. Start at the feet and work up the legs, then the buttocks and lower back, tummy, chest and shoulders finishing with each arm and the hands.